Sheep Thrills Farm: Is that a Dust Bunny? No Wait! It's Invaders! Home of Registered Shetland Sheep in Flagstaff, Arizona - Also lovingly known as "Oleo Acres, One of the Cheaper Spreads". Is that a Dust Bunny? No Wait! It's Invaders! It's been a busy week around Oleo Acres. Hizzoner, my DH, was out of town, so naturally we had 6" of snow Tuesday morning! Then rain and wind set in...followed by more wind just to make sure the Weather had my attention. There were times the roof sounded like it was going to blow off. I kept watch of the shingles on the barn roof - watching them flap up and down, waiting for one or two to fly up, up and away. As if that weren't enough, by Saturday the weather had turned from nasty to nice to awful again. Today saw us in the 80s! I would say this is bizarre, but the fact of the matter is that here in the mountains we can have snows in June, frosts in July, or hot weather in April. So, none of that weather is particularly earth-shattering. What IS unusual is that it all occurred within a week's time. To top things off, as I was coming down from the mailbox on Saturday I noticed something odd under the front deck by the door. We get a lot of leaves blown up again the deck making it look like the deck hits the ground when in reality there is a space between the ground and the wood. But to the left of the front door, a bit of a hole had been dug and there were two kitten heads sticking out of said hole, eyes closed enjoying the sunshine! What the ....??? So, now I have a semi-feral cat complete with kittens living under the front deck for now. Tomorrow I shall start making plans to extract and capture said Mother Cat, complete with family. The plans already include the vet, shots, ear mite meds, and when she's able - spaying. Homes will be found for kittens. I will try to not do this through the shelters here as we've heard they are bursting at the seams with litters of kittens right now. I think we'll just have to take it one step at a time. I will keep feeding Mama good food so she can have the energy to feed her growing family. The kittens eyes were open. They looked to be maybe 4 weeks old, but I'm not sure. It's been years since I've had a kitten. Now I assume all cats come in at 10 lbs. or better and insist on lap time each day. We already have five cats now. I really didn't want to deal with a Mama and her brood. Then again, I've never really been one to run away from things like this either. We'll just do what's right and hope for the best for everyone. So, no pictures today. Sorry. But as soon as I can get a good picture of the little family without scaring Mama or the little ones I'll post it. My allergies to cats will really be happy about this! Oi! But we just will do our best to make sure the kittens find homes, and if Mama won't want to be a housecat, have her spayed at the very least so she doesn't have any other litters. We think someone dumped her as she looked well taken care of when we first saw her around. I think it's neat that you're taking this on, in spite of your own allergies. Now I don't feel so bad about wanting to keep our "foundings"...it's hard not to do what you can when you see animals in need. Good for you! Perhaps the critters have us figured out, and come to us for a reason? I keep trying that line on my DH, but I don't know if I am making any headway. Note: This blog and its contents, both text and photos, are protected by copyright laws. Any reproduction of either without written permission of the blog owner is illegal and is prohibited. 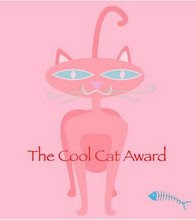 Cool Cat Award from Uncle Rascal!